The thunderous roar of the grizzly bear awakens the wilderness as the surrounding massive glaciers melt and split away from the frozen tundra, forming wild currents and cascading waterfalls. The salmon fight for survival as they follow there natural breading grounds up stream, all the while being preyed upon by a bald eagle. Enormous whales flank the Spanish Galleon now sailed by our famous pirate as she continues the HSR story. This scene is stunning in it’s beauty and realism, keeping viewers in awe. 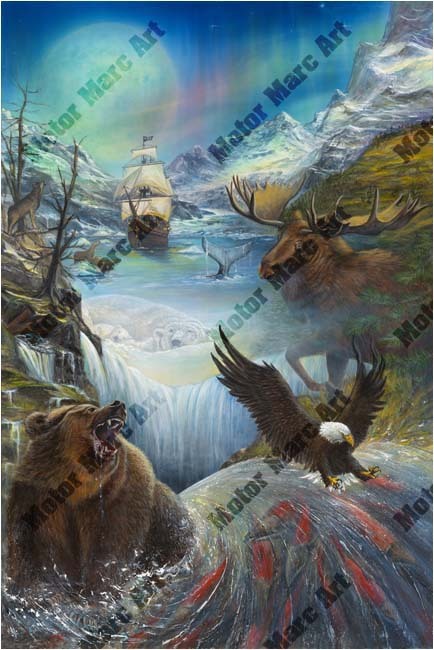 MotorMarc is pleased to once again be the official artist for the Alaskan High Seas Cruise. Marc will be revealing his new High Seas Alaskan artwork during the event. This year fans are in for a treat because he has incorporated many new hidden treasures for you to find and win in this exclusive piece of art.